The data is shown using three orthogonal slicing planes. The x-view (red) shows y,z-slices, the y-view (green) shows x,z slices and the z-view (blue) shows x,y-slices. The red, green and blue lines indicate the current position (given by the slicing position of the three planes). These lines can be hidden with the Position checkbox in the lower right. In the lower left, the current coordinate under the mouse are shown. In each of the three slice views, there is an overlay dedicated to navigation at the top. The x-view has a red color, y-view has a green color and the z-view has a blue color. Navigate to a particular slice number. Click into the spin box and type in a new slice position. The arrows rotate this view by 90 degrees left or right. The button in the middle swaps the two axes. Indicates the current zoom percentage. Zoom to fit (show the entire slice) and reset the zoom level to 100%. Dock the slice view out of the application window. The view becomes its own window, which can be moved to a second monitor for example. To dock the view back into ilastik’s main window, click the arrow again. Maximize the slice view. The other two slice views will be hidden. Clicking this button again restores the original layout. toggle the visibility of x, y or z slicing planes. Often, because the planes are draggable, they hinder the interaction with the data or make it difficult to rotate the view. Toggle anaglyph (needs red/blue glasses) rendering. 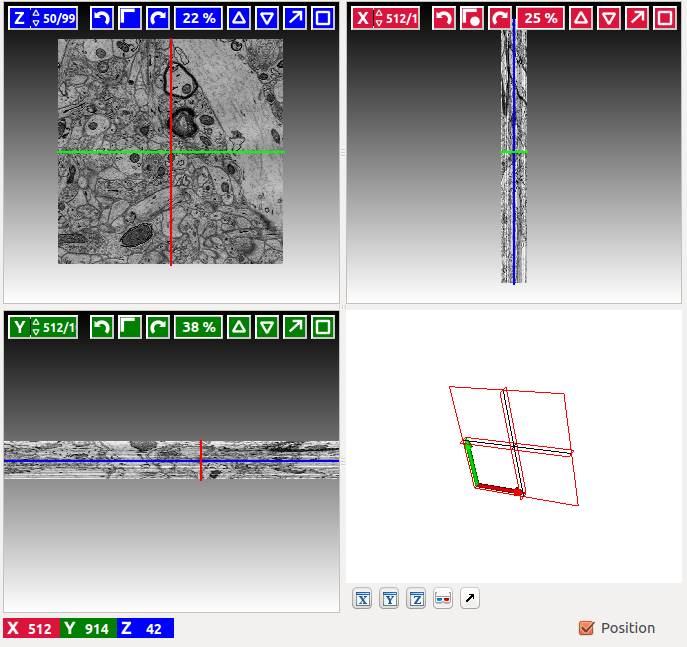 Dock the 3D view out of ilastik’s main window (for example to move it to another screen). Another click docks the window back.